We are the surf camp committed to bringing you the ultimate surf adventure in Morocco ! Sunset Surfhouse offer a full range of surf and yoga lesson & travel packages, so everyone can get involved… whether you want to learn to surf, get the wave of a lifetime at Anchor Point or explore the culture and country, we can offer you an unforgettable experience. What can you expect with us ? As well as warm waves all year long and amazing weather, we provide tailored packages for all levels of surfers… we cater for everyone from first-timers and progressing intermediates, right through to all you big swell hunters looking for the ultimate ride ! 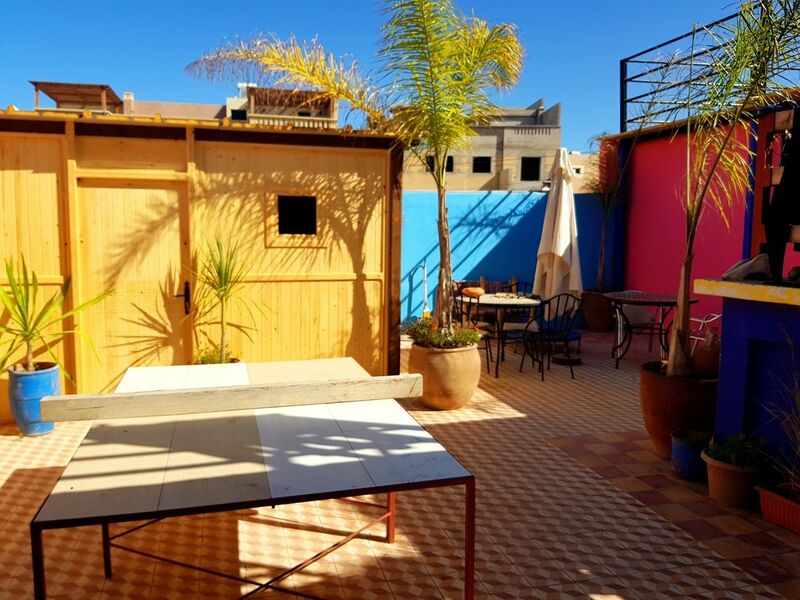 Specialist yoga classes will get you inspired & energised with the ocean views from our roof terrace, and you’ll be relaxing in style with our traditional Moroccan accommodation options and delicious, healthy food. And if that’s still not enough Moroccan excitement for you, you can even jump on a camel for a trip down the beach! Join us to experience the real Morocco and discover the vibrant culture, incredible landscapes, friendly locals, and of course, the unforgettable surf. See you on Moroccan waves ! In addition to surfing you can decide to try many other activities, from hiking to nightlife passing through the beauty and body care. In the beautiful terrace of Sunset Surf House we have equipped an area dedicated to those who want to get closer to the discipline of Yoga. A master will teach you the basics of this ancient ritual, but if you already have experience and are looking for a space where you can meditate, we will be happy to offer you a moment of privacy to recharge your batteries “In full space”. When the last rays of the sun touch the ocean, the water turns into a flaming table lapping the beach. This is the ideal time for a horseback ride on the beach. If you love the sport or just if you like to “taste” this unusual activity, ask the staff at Sunset Surf House will be at your disposal to organize this experience. A half an hour away from Aouir you can spend a day among the palms of Paradise Valley, a gorge famous for the beauty of small waterfalls formed over the centuries by the streams. To get to the waterfalls and natural pools you have to walk a few miles, but if you prefer you can choose by mule. Once there you can take a dip in the natural pools, camp for a night or prepare the BBQ in the dedicated areas. If you wish, in the surroundings of Paradise you will find many opportunities for shopping in the craft villages arosed between the secular palms as Immouzer. Agadir is one of the “gates” of the Souss Massa National Park, an area that extends for many kilometers and is a protected area since 1991. The Souss Massa is full of many beautiful landscapes and a variety of unmatched: from the cliffs overlooking the ocean, to the rivers in which they live ibis, the citadels unforgettable as Tznit, Ouarzazate and Sidi Ifni. Tours are available in the park with specialized guides and Sunset Surf House will be happy to let you live this experience. A visit to the souks of Agadir is a must for everyone. A real open-air mall where you can buy spices, natural perfumes, souvenirs and so on. The souk is one of the centers of the city and you’ll find everything food, clothing, furniture, pottery and antiques. Many items are made for a daily use, others very specific and it is good to take all the time necessary to study carefully the shops. The Aouir souk is smaller and characteristic, is held every Wednesday, and you will find fresh fruit and vegetables as well as spices and food. 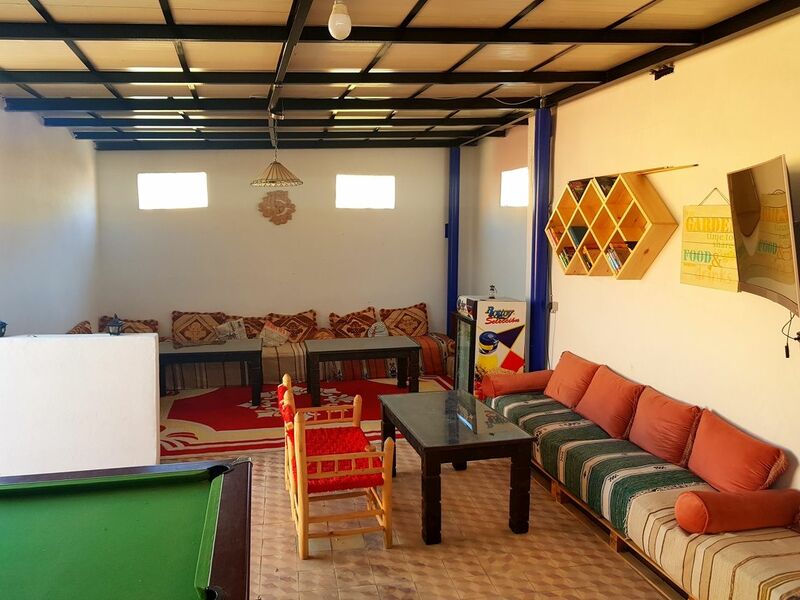 Our Surf Camp is located 10 minutes from the beach in the small village beside Tamraght Taghazout. It is an ideal place to relax and explore the region, mainly for surfers and for those who love adventure. SunsetSurfHouse is a place of relaxation and hospitality just a few steps from the golden sandy beaches and the Atlantic Ocean. SunsetSurfHouse is immersed in the daily life of Tamraght, so nearby, you can find several shops and services. Walking down the street you will have the chance to enjoy a coffee, or a typical mint tea, or buy at the market of the village whatever you might need. Even a small pizzeria, a beauty shop with massages and a perfumery where to find organic products based on Argan Oil. 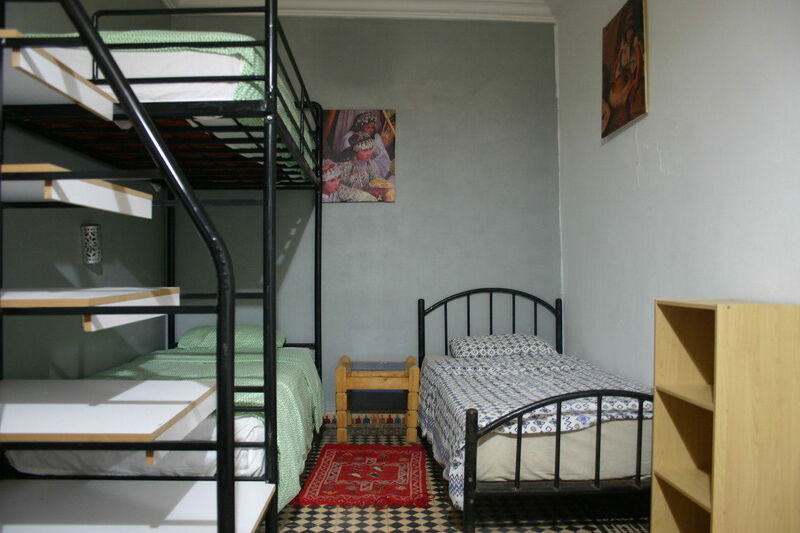 If you want to rent a car service is just in front of SunsetSurfHouse, as well as the public bus stop to Agadir. For your surfing equipment you can rely on local shaper and the many surf shops in the surrounding area. The surf school operates every day and for all levels. The surf instructors are all licensed by the Moroccan Surf Federation. You learn to surf with qualified instructors as surf instructors. They will take you every day at the most appropriate spot for practice or learning surfing, depending on your level. Whatever your level of surfing are sure will be an unforgettable moment. Surf lessons all day, six days a week. The side of the Cathedral there is a perfect left at high tide and low tide right. On the other side you find a magic bay with a long straight that can unroll up to 900 m at low tide. After surfing you will be at the table to taste fresh fish from local fishermen. A sandy beach with a left and right at high tide in small swells. A powerful right for experienced surfers. A beautiful right difficult for beginners. Small reef that works well in right / left, at high tide, when it is less than 1.5 m.
Micro right with a take-off area restricted. Front parking / camping tip Anchors. The best straight from Morocco. Perfect in big waves with a soft tip facille learn. Hash Point: The wave of pareseu smokers! Small sandy beach. Panorama's: A perfect right at low tide, especially for beginners. Right perfect if there is no current. A beautiful right at low tide and left / right at high tide. Surfable up to 1.5 m.
Perfectly exposed for a N/W swell coming down, generated by depressions from Northern Atlantic, the Moroccan coast gets all kind of waves. Thanks to the wind protection in some rocky beachbreak spots, conditions can turn out fantastic in winter with 1 to 3.50m waves. From May to September, conditions are more hazardous and less regular but you can have some very good sessions. In winter, the moderate offshore winds blow N/E giving amazing conditions from October to April. From May to September, the “Chergui”, a warm N/W wind blows and can spoil the quality of the sessions. Tides vary between 0.6 to 2 meters and may affect the non-profound water spots. Many sea-urchins and rocks – bring boots. You need a 3/2mm wetsuit from November to April with a water temperature between 16°C and 19°C. From May to October, a swimsuit, a top or a springsuit is sufficient. Agadir : Large sandy bay where some beachbreak peaks unroll and have a tendency to close up to 1.20m. Walking South towards Oued Massa’s river mouth, close to the Presidential Palace, some quality peaks. An alternative when the coast saturates. Bo & Co 2 : Beachbreak that can prove fantastic (it depends of the sand-bank). A fairway takes you to the spot without paddling and without the wave crashing above your head. It starts in a powerful basin offering you a very tight tubular right and/or a left that has a propensity for turning around itself even with a very hollow section. This spot works from 30cm to 2m, 2.50m max and need little swell on the usual spots, very sensitive to the wind. For every surfer. Bo & Co 3 : Very good-quality right and left on flat stones that can end up under the sand according to the time. The environment is gorgeous, needs a little swell on the usual spot. For intermediate surfers. The 11 and the 12 : very nice lefts, tubular during the first section on a rocky flat stone, reef wave feeling when take-off – to surf especially in low, rising tide.Banana : Long right coming from a cliff and ending up on a pebble or sand beach. This low tide wave can be extraordinary, turning into a nice right left peak and sheltered from the Northern wind in the rising tide. Le Rocher : Small beach isolated between two rock advances. Beachbreak that can almost always be surfed with some very good-quality waves sometimes. Mysteries – La Source : Risky right according to the sand silt up, starting from a rock vein. Although it can be awesome, the surfers often sulk it. A great opportunity for a quiet surfing session between friends. Killer Point : a long right on the flat stone working in various size and composed of 3 sections: - the first one, the farther is a large basin - the middle one, much longer than the 1st one is composed of lots of quick sections- the inside, long and hollow, is smaller and steadier.When the swell is quite heavy (1.50m), those sections can be connected and the wave allows a 300m surfing. From this size, the wave current and power become dangerous and require a very technical surfing. Bo & Co 1 : Very pretty spot with rocky flat stones in front of a little cliff, in a gorgeous and deserted place. A good swell is necessary to work, you can also surf at La Pointe and Killer to surf peacefully, the spot is working from 1m without a size limit. Long right made of hollow sections, the quality and the difficulty of the spot depend on the sand level covering the rocks. Not easy coming in and out the water in high tide. For intermediate surfers. Bouilloire : also known for its sea-urchins, this is a spot that well-receive the swell. Offshore wind, sideshore by a Northern wind, a very good right on the flat stone of the rock. Not many waves, very quickly crowded and can be surfed from low to half-tide. Not easy launching and coming out of the water for those who are not used to rocks, boots are recommended. Reachable for regular level surfing. Dracula : Impressive place, incredible right, probably the most powerful of all, reserved for very good surfers, can handle heavy swells, difficult launching, and uncertain coming out of the water. Tamri : A beachbreak that takes well the swell in little condition days. In the Western minds, Morocco embodies all the Eastern seductions. A myth that is still establishing itself: Marrakech, Rabat’s mosques, Fes’ medina, an adventure from the Atlas Mountains to the desert’s immensity…You definitely have to understand the romantic fascination that Morocco has exerted on the Western artists.Imperial cities, Berber Kasbahs, sumptuous mosques…the former French protectorate knows how to take the various faces of an Eastern charmer. Morocco is a country bordering both seas : the Atlantic Ocean and the Mediterranean Sea. The Atlantic coast is spreading out 2 800 km wide, whereas the Mediterranean coast only has 530 km of coast. It is bordered of plains (Sebou, Mesema and Sous) which are the most populated and rich regions of the country.Beautiful beaches, harbours, and large centres like Casablanca, Safi and Rabat are following one another. Today, like every Arabic country, we distinguish the classic Arabic (or literary, accessible to the literate people) which is the language of education, administration and medias from the dialectal Arabic, spoken language that change according to the regions and the social classes.Berber is the second language, used in many Moroccan regions. Most Moroccans who went to school can speak French. Moroccans have their own way to read the road signs. Here, everything can happen; therefore you need to pay attention.You should not drive at night. In case of accident, call right away the consulate and then the Police (very often you are first locked up and you may talk later). Moroccan’s money is Dirham. 10 dirhams (Dh) is about 1 euro. Credit cards are accepted in most important institutions (hotels, restaurants, shops) and in most gas stations.There are also in the large centres ATM machines where you can withdraw dirhams with most credit cards. Reviews on "SUNSET SURFHOUSE MAROC"